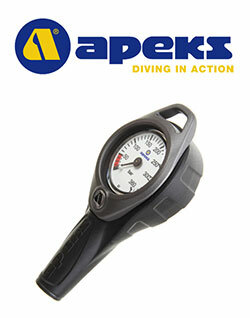 The Apeks submersible pressure (contents) gauge, with an internal Bourdon pressure measuring mechanism, gives you clear information on the gas contents of your cylinder. The gauge indicates the cylinder bottle pressure and the dial range is from zero to 360 Bar (an imperial version is also available with a range up to 5000 Psi). The dial face is designed with clarity in mind by being uncluttered, with large black figures on a luminous background giving a long phosphorescent effect. This makes viewing as easy as possible, even in poor visibility conditions. * A large loop area designed into the housing allows for easy attachment. * There is an over-pressure capsule fitted in the back of the module to prevent the screen from exploding in the unlikely event of the internal mechanism failing.